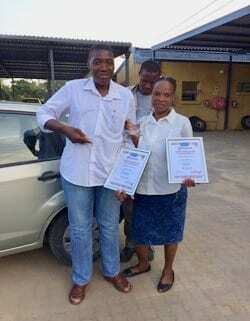 Victor Seale (driver) and Grace Ndlovu (database administrator) are proud to be involved as Nompilos (caregivers) with the Hlokomela programme. Hlokomela is an award winning HIV and AIDS educational and treatment programme targeting workers in the agriculture, nature conservation and tourism sectors in The Greater Kruger to Canyons area. The programme aims to reduce HIV vulnerability through peer education, raising awareness, prevention and treatment. Hlokomela’s services and projects are focused on three main areas: Healthcare, Income Development Projects and Administration. Hlokomela raises awareness of HIV/AIDS, tuberculosis, cancer, diabetes and malaria through trained Nompilos. Victor and Grace use their positions at the SAWC and in their communities to reach out and provide support and education on healthy living. Our Nompilos attend monthly meetings at Hlokomela to share their experience and develop their own skills as counsellors.